A couple of weeks ago, we went wine tasting in Sonoma County. Bella Vineyards is a favorite of ours, and the dogs like it too. I did it -- I carved a sloppy version of a Cylon for Halloween. I think it'll be the Red Sox in 5 games. POST SCRIPT: There are free "tacos" involved. On Monday, I had all four of my wisdom teeth removed. Lidocaine only. No nitrous. No twilight. I was conscious through the whole thing, so yes, I knew about the cracking, digging, tugging, and pulling that comes with this procedure. To be honest, it wasn't the worst thing in the world. I felt bad for the nice dentist lady as she struggle with two of the four in particular. I worried that she wouldn't be strong enough, but in the end she got them all. Now I'm recovering and have been eating liquid and mushy meals all week. Elias and even Robin kept me in full supply of soup, mashed potatoes, and those fancy juice drinks. But no meat for days! Today, I stepped it up with macaroni and cheese and ground taco meat (beef!) from the Whole Foods prepared foods sections. Yum! I'm chewing (sort of) again. Today I saw a car with half a dozen bumper stickers. One that caught my eye promoted single payer health care. The other one that appealed to me said, "Pray the Rosary." Makes sense to me. Even though I vowed, less than a month into our relationship, that I would never play Scrabble with Elias again because he's too smart and knows too many words, I'm back at it. 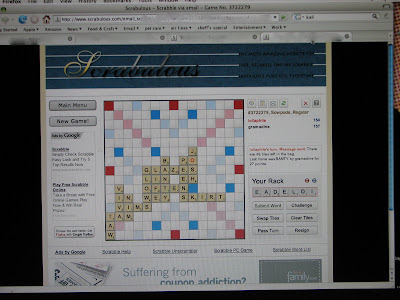 I'm playing email scrabble with Elias. It started out friendly enough as a game with Xui and Elias, and it's turned into more 3-way games and side games, tete a tete avec Elias. For the past 3 or 4 days, these games have taken up most of my internetting time. I keep losing, but I keep playing.